Richard J. Egan Painting Contractors Inc.
Richard J. Egan Painting Contractors has maintenance contracts with several Home Owners Associations. The homeowner calls the Management Company and submits a work request. The Management Company then issues a work order to us to do the work. The work order states the work to be completed, customer name, address and phone number. It also assigns a priority to the job, e.g. same day, 1-2 days, 3-4 days, 10 days. The work is then completed by one of our employees. Our employees are clean, courteous, uniformed workers that are professional, well-trained and properly equipped to do the job. When the work is completed we submit a bill with a copy of the completed work order to the Management Company. The work completed is billed as Time and Material, $ 38.00 per hour, plus the cost of the material. If we receive a work order and determine that the work to be done is extensive and would cost over $ 500.00, we will submit a proposal to the Management Company detailing the work involved and the cost. Stucco repairs, deck repairs, replace rotted wood, painting, clogged gutters and downspouts, change light bulbs, window caulking, siding falling off, woodpecker holes, leaks, minor electric, mailbox post broken, trash door stuck or broken. 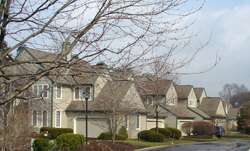 If you are interested in finding out more about our maintenance contracts, please contact us at 610-353-3570. Richard J. Egan Painting Contractors, Inc. Copyright 2019 Richard J. Egan Painting Contractors, Inc.